Pests can invade homes in a number of different ways. Some gain access from luggage when returning home from trips. Some get in from package deliveries Another way is from the purchase of used furniture. If you ride public transportation, you could bring an unwanted visitor in with you. Even movie theaters have been known to harbor insects that would love to come home with you, such as bedbugs and roaches. Sometimes even our guest that comes by for a visit may leave behind a few unwanted visitors. The most common way pests gain access is from unsealed openings in and around our homes. Ants, spiders, earwigs, and termites are just a few of the insects that take advantage of unsealed openings and invite themselves in. Even rodents such as mice and squirrels enter attics, basements and crawlspaces through unsealed openings. An example is the house mouse that can squeeze through any opening that is larger than 1/4 of an inch. A rat needs 1/2 an inch or more. Rats and mice can climb any vertical surface where they can get a claw hold, this would include any vegetation growing on exterior wall surfaces, and rough exterior wall surfaces like masonry, brick and stucco. They have even been seen descending head first down a rough wall. The best way to prevent rodents and insects from getting in to your living space is by periodically inspecting the exterior of your home. Look for worn caulk around windows and door frames. This includes garage vehicle doors with weather strips. If you find the caulk is worn, remove the rest of the caulk completely and reseal with new caulk. Another area to inspect is the exterior walls. Cracks in foundation walls like the one in the picture above should be sealed to keep out not only insects such as termites, but also moisture which can lead to mold growth. 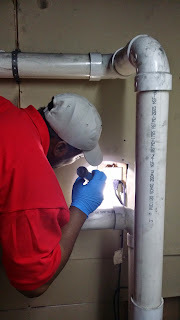 Unsealed plumbing penetrations is another area for observation. Outside water faucets and/or plumbing lines for a central air condition unit check that all wall penetrations are properly sealed. The picture below shows enough space for rodents and insects to enter with ease. Finally all interior walls should be repaired. If insects and rodents have access to the inside of walls, floors, and ceilings, they can roam through out your house, reproduce and spread germs and diseases. Your pest control professional will check these areas and more to help aid and prevent pest entry. Because subterranean termites have a rather high moisture requirement, they need an environment of high relative humidity. The moisture in the soil and the air spaces between the soil particles usually provides the termite colony the atmosphere they need to thrive. Areas where high humidity are commonly found are unventilated basements and crawlspaces. If sustained over long periods of time however, other sources of moisture can serve a colony of termites needs such as roof or gutter leaks, and defective plumbing. Often it is very difficult for subterranean termites to maintain humidity near or at the saturation point in their feeding galleries and shelter tubes. When they build their shelter tubes on masonry and wood, these materials will absorb moisture, thus causing problems within the tubes. In an effort to reduce the loss of moisture to the environment termites line their tunnels with secretions that hardens and forms a moisture-resistant layer. Another problem presents itself in the form of distance. Termites are often unable to feed on wall studs more than a few feet from the floor because they would be to far from a humidity source. Floor joist too represents an increased linear distance from the moisture source. So to provide more moisture to the joist, termites construct hanging earthen lined shelter tubes downward from the joist as shown in the picture below. Poor ventilation in basements and crawlspaces often provide an atmosphere of high relative humidity. It's under these conditions that the joist will absorb moisture and become more susceptible to damage. In this basement the humidity level was well over 70%, enough for a major infestation. Severe damage was found in the support beams and floor joist. Remember, even though subterranean termites are associated with wet or moist soil, it's not always necessary that soil contact is maintained. If moisture and temperature is suitable colonies can survive indefinitely isolated from the soil. So it's important, particularly in basements and crawlspaces that humidity levels are low and walls and floors are kept dry. 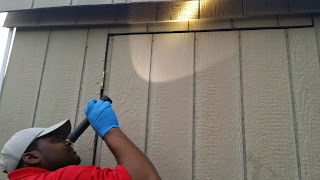 Careful inspections are the key to any pest control treatment. A proper inspection can help to determine the pest, the extent of infestation and the right treatment method. 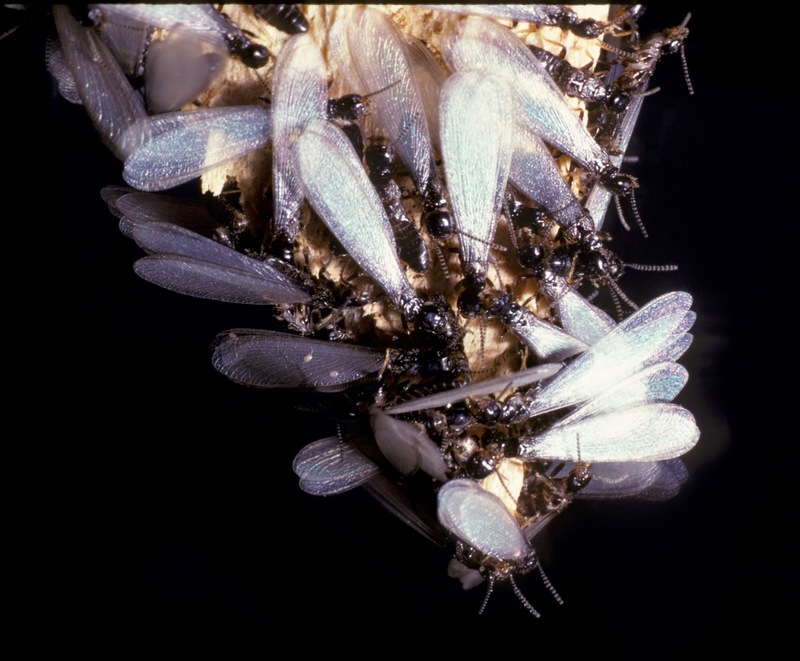 You may think your dealing with Carpenter ants when in all reality you may have termites. 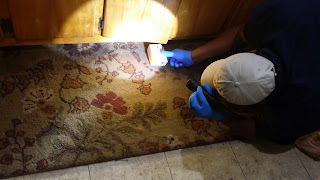 Most pest professionals are trained to distinguish many 'LOOKALIKE" pest from there counterparts!! !